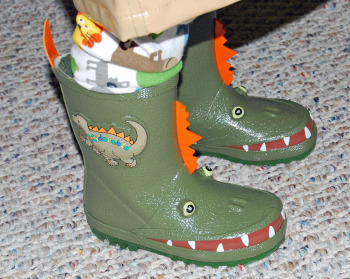 A couple weeks ago, we had too much rain, and my son could have worn his new Kidorables Dinosaur rain boots indoors to keep his toes dry. We haven’t had much rain since then, but we’ve had GOBS of snow. If you live in central Virginia, you may have heard the terms Snowmageddon, Snowpocalypse used to describe last weekend’s two foot onslaught (on top of all the other snow we’ve already had this record-setting winter). So, instead of splashing in rain puddles, Calvin’s been wearing his rain boots everywhere, and especially tracking through the snow. 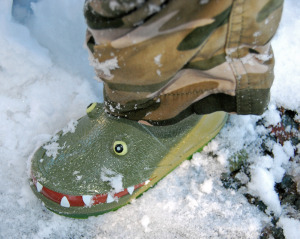 I love the great rubber gripping treads in slushy or packed snow. 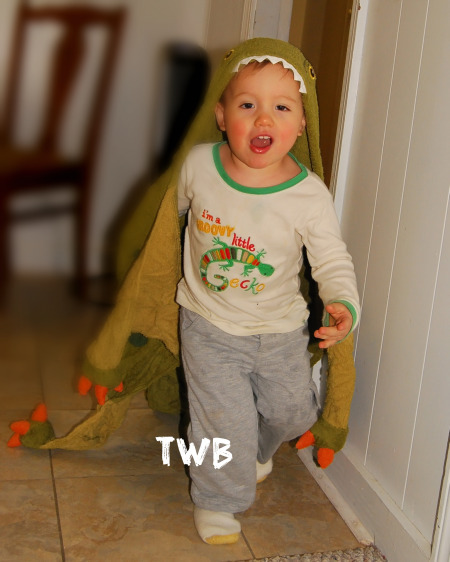 He loves the dino teeth and eyes. His favorite part? He can slip them on all by himself. He proudly stomps around and announces this feat every. time. he puts them on. every. time. 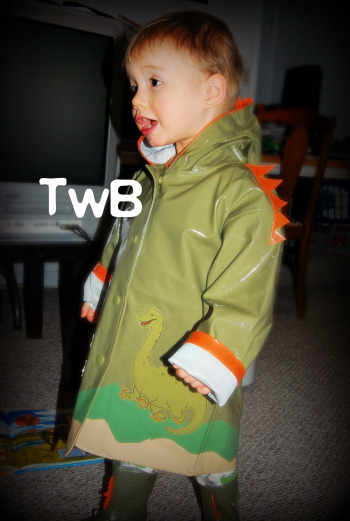 Although 14 degrees is still too cold to head outdoors with a thin rain coat, he’s armed and ready for the rains of spring in his matching dinosaur rain coat. I like the wooden dinosaur hanger that comes with the coat. See this one on the left? That’s one cute brontosaurus. But, they’re not nearly as cute as the little guy wearing the coat. After an afternoon of sliding through the snow fort and cobbling together a snow baby, Calvin likes to head indoors for a cup of warm lemon-blueberry tea followed by a soak in the tub to warm up his fingers and toes. After the bath, he roars around our home in his dinosaur towel. I just wish the photo above had sound…can’t you just hear him roaring? 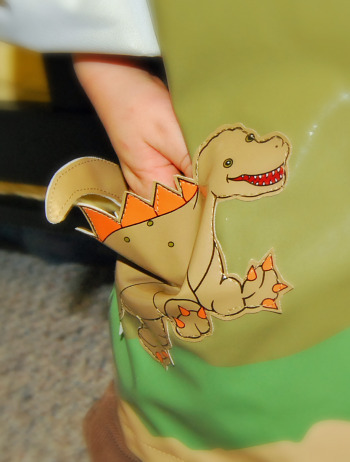 There’s little pockets in the top claws where he can grab on to create the perfect dino dude. 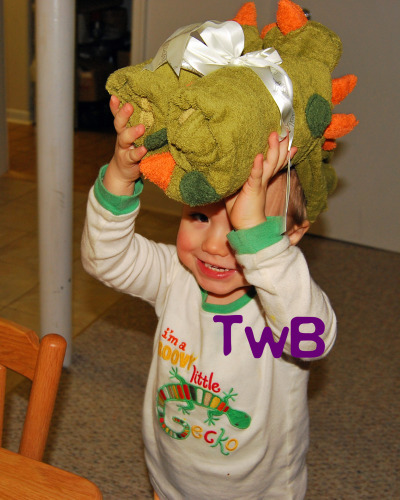 And when he’s not pretending to be a dinosaur, then he just walks around in a very big green hat. The towel arrives rolled up and secured with a pretty white bow. It’s tucked nicely in a reusable plastic bag with a canvas strap so you can keep it dry when you haul it to the pool in the summertime. If you get a lot of spring rain in your neck of the woods, Kidorables creates fun ways to present your valentine with an imaginative and practical gift. 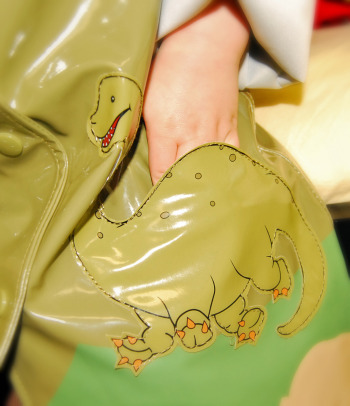 Besides dinosaurs, they also feature their classic ladybug and frog designs. Not into dinosaurs? How about pirates, firefighters, mermaids, or pink cats? If you’re going to have 6 more weeks of winter, check out the knit scarves, and gloves & mittens available. 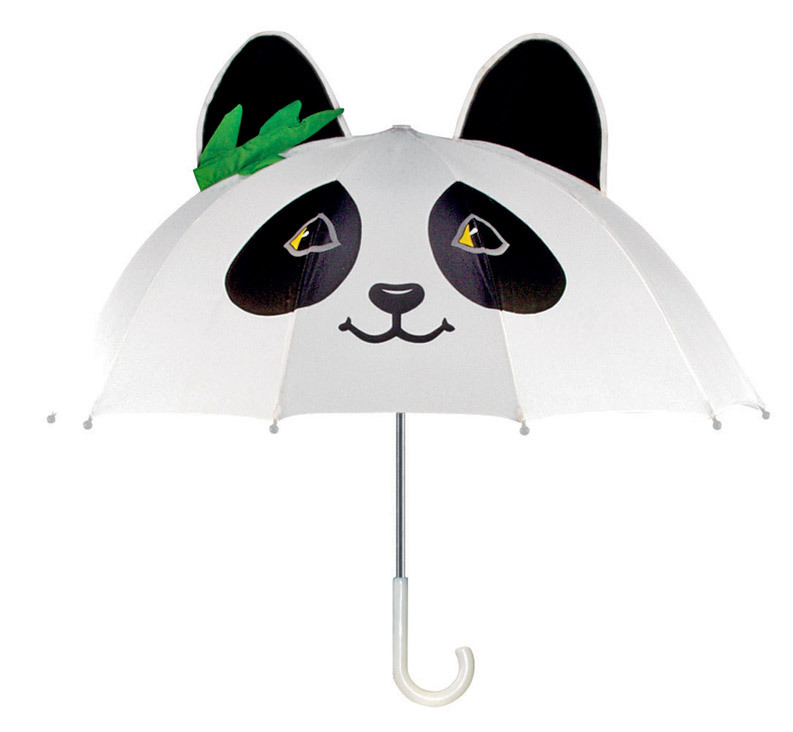 One (1) winner will receive a Kidorable umbrella of choice (retail value $13.50)! To enter, please visit the Kidorables website, and leave a comment describing your favorite style and item on this post prior to February 14th at 11:59 p.m. Please follow the contest rules and avoid any generalized comments, or you will be disqualified. FOR A SECOND ENTRY:Become a Facebook Fan of Kidorables, then leave a comment telling me you did so. 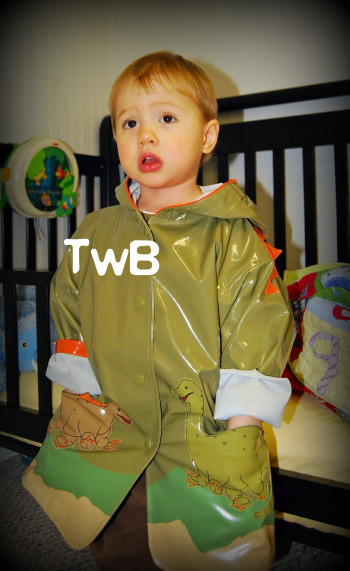 FOR A THIRD ENTRY: Follow @drdolly and @kidorable on Twitter for a coupon code and another opportunity to win a Kidorable umbrella. FOR A FOURTH ENTRY: Tweet (include @drdolly) about this giveaways or the Valentine’s Day gift guide, then leave a second comment telling me that you did with a link. FOR A FIFTH ENTRY: Blog about the Valentine’s Day Gift Guide or this giveaway, then leave a comment with a link to your post. FOR A SIXTH ENTRY: Enter another contest on the Valentine’s Day Gift Guide, and leave a comment telling me which one you entered. *I received product samples from Kidorables for the purpose of this review. Read my full disclosure policy. *UPDATE* Congratulations to #21, CherylW! Do you remember those fun perforated valentines that children exchanged in elementary school? I remember being very particular about what was printed on each card before determining which classmate ended up with it. After all, I did NOT want to misconstrue any feelings beyond platonic friendship to the boys in my class. I don’t know if other first-graders went through such meticulous pains with choosing who received their valentines when scribbling names onto the red and white paper with a sharpened #2 pencil. If you’re not into the sappy love language for classmates that you’re bound to find in every big box store pack of premade valentines, you could 1) make your own from scratch, or 2) order your own from Next Day Flyers. Friendly wishes, more heartfelt greetings, or just cute puppy pictures are all available for you to choose. You can order 100 of them on 1/4 page flyers for $17.95 with FREE personalization. I’m kinda smitten over the punch-out cards. These cards would be so much fun for a Valentine’s Day party as invites or greetings. If you don’t have 100 classmates…then share an order with friends or save them for next year. If you like sending valentines to family members, then check out the 4×6 postcards printed with high gloss UV or satin matte finish on ultra thick card stock. Next Day Flyers also makes custom door hangers and greeting cards–something I think I’ll use for Christmas 2010. Next Day Flyers is an eight year-old California-based company that creates custom printing for customers nationwide. Since they’re based online, they’re available 24/7…how convenient! One (1) winner will receive $50 worth of free printing credits on Next Day Flyers. To enter, please visit Next Day Flyers, then leave a comment here on what you’d use your printing credits toward prior to February 14th at 11:59 p.m. Please follow the contest rules and avoid any generalized comments, or you will be disqualified. *I received compensation for this post. Read my full disclosure policy. *UPDATE* Congrats to #4 Carlita! Did your family end up with holiday gifts that require batteries? Thankfully, we did not, but during my son’s first year, he received multiple gifts that sucked down batteries faster than we could keep up! Not only was I concerned with proper disposal of the batteries, but I was also concerned about the environmental footprint they’d leave behind. I’ve tried rechargeable batteries in the past, but they just don’t last as long nor pack the same power punch as traditional batteries. So, when I heard about Fuji’s new Enviromax batteries that are branded as environmentally friendly, I thought they were worth a try. Iron-nickel batteries are a very old technology (over 100 years). Nothing ground breaking here, but maybe there will be a new appreciation for them given the relative environmental friendliness of the materials in them. The batteries are relatively heavy, expensive to make, and have poor charge retention. I love that Fuji is taking the lead on green batteries, even if it is re-marketing old technology, and I hope other manufacturers will follow suit. Meanwhile, if your holiday gifts are running low on battery juice, the Enviromax batteries by Fuji are a great way to re-charge while being kind to the earth. When a 2-pack of Cs or 4-pack of AA’s run $5.99 they’re comparable to conventional batteries in cost as well as power, at least in my experience. One (1) winner will receive a 2-pack of Fuji Enviromax batteries in size C (retail value $5.99) and 4-pack in size AA (retail value $5.99). 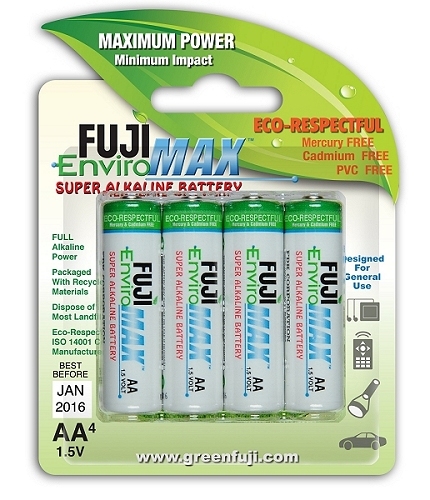 *I received a product samples of Fuji Enviromax AA and C batteries for the purpose of this review. Read my full disclosure policy. *UPDATE* Congrats to #19 LauraB! 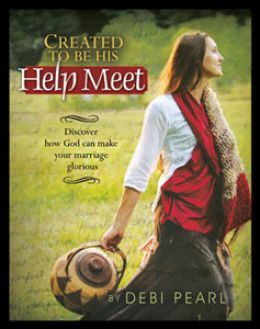 Last fall, my sister gave me a copy of Debi Pearl’s incredible book on marriage–for women, Created to Be His Help Meet: Discover how God can make your marriage glorious. I’m half-way through this book, and I started reading it a week ago. It’s THE best book on marriage that I’ve read to date. Since my husband and I said our vows 9 1/2 years ago, I’ve read several books on becoming a godly wife, an excellent wife, praying for my husband, etc. Through them all, I’ve gleaned bits of wisdom that have helped me learn how to flex and grow into the wife and woman I was created to be. Yet, Pearl’s Created to Be His Help Meet is by far the most piercing, eye-opening, revealing, and biblically-consistent book on marriage I have read. I can’t wait to get this book into the hands of every married woman I know. It’s serving as the basis for my personal Bible study time…I’m using it along with a Bible, and (just because I want to) Strong’s Exhaustive Concordance of the Bible . If you need encouragement in your marriage or desire for your marriage to be as loving and strong as the day you first said “I do,” or if you know of a woman who does, this book is one of the most loving valentines you can find. It’s available for $8.64 on Amazon.com . *There are affiliate links contained within this post. Read my full disclosure policy. 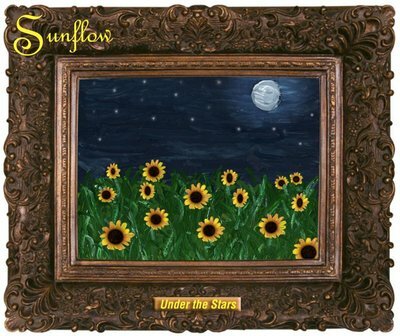 Sunflow’s Under the Stars is a lush collection of lullabyes and soothing songs by Dublin-based duo and parents Nancy Falkow and Fran King. Originally intended to be a “children’s album” it surpasses the limitations of that musical genre, and is instead an inspirational album for the entire family. The songs alternate between the James Taylor and Paul McCartney vocal inspiration of King to the ethereal yet earthy pipes of Patty Griffin-influenced Falkow. These are songs that will inspire you to sing your own original lullaby to your little one…and at the very least, you’ll enjoy singing along. Under the Stars is a rich, instrumental and vocal masterpiece–truly a valentine to little loved ones. This album is cherished in our home for relaxing and peaceful pleasures for all ages. 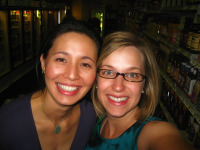 Get your video preview on the Sunflow MySpace page. The 10-track album is available for purchase via download or CD purchase through It’s About Music for $12.99. 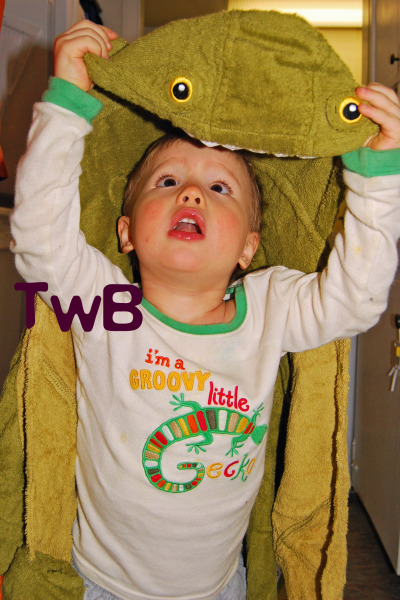 Wholesome fun with delightful lyrics and earthy vocals make Earthworm Ensemble a musical treat. There’s so many musical artists that collaborated on this So-Cal folksy-country-rock-rappin’ project that I’ll refer you to earthwormensemble.com for the full list. The album roars to a start with “The Traveling Train” that choo-choos by with the most delicious cargo before winding down to a full-stop. The Pizza Moon is a recipe rap about a dad cooking up a pizza for the kids while mom is out with friends at a Dave Matthews concert–totally creative and fun. Our family had a living room hoe down from tracks 5 (Bang a Drum) to 9 (Walking Boy). Our family do-si-doed and circled around and back again. During track 7 (We are Birds), Calvin spontaneously started flapping his arms like a bird (and I followed his lead) and he sang along. Instead of indoor soccer, I think dancing along to Earthworm Ensemble will be our new indoor evening family activity. Truly, this green-a-licious album will have you licking your chops, stomping to the licks of your imaginary drum, and urge you to impulsively plant an organic garden. Available on Amazon.com , Earthworm Ensemble retails for $16.99. Three (3) winners will receive a downloadable copy of Under the Stars (retail value $12.99). The downloadable version will be available to the winners for 5 days (and they can share the download login and password with as many people as they like in that time frame!). Two (2) winners will receive a copy of Earthworm Ensemble CD (retail value $16.99). *I received product samples of Under the Stars and Earthworm Ensemble for the purpose of this review. Read my full disclosure policy. *UPDATE* Congratulations to the winners: #1 Wehaf, #9 Julie L, #11 Laura B (Under the Stars); #4 MJ, #7 Henria O (Earthworm Ensemble). I love Valentine’s Day! It’s not all about chocolate, hearts, and pretty cards (although those things do make me feel all warm and fuzzy). When I was a resident assistant in the largest dormitory in North America,during my undergraduate days in Austin, Texas, I made a special Valentine’s treat for the women on my hall. In cellophane bags full of foil-wrapped chocolates, I attached a small piece of paper with the history of Valentine’s Day and shared a valentine with each of those wonderful gals. Back in 3rd century Rome, Emperor Claudius II decided that single men were better soldiers than married men with wives and families, so he prohibited young men (his drafted soldiers) from getting married. Priest Valentine realized this decree was unjust and it defied the word of God. So, he performed marriages in secret–how utterly romantic. Unfortunately, Emperor Claudius II eventually learned about Valentine, and he was ordered to death, thus he became Saint Valentine. Beginning tomorrow until February 14th, Traveling with Baby’s Valentine’s Day Gift Guide will feature almost-daily posts of gift ideas for a family-full of valentines. The gift guide posts will replace regularly scheduled columns Tuesday Travels and wellBEing weekends. Once the gift guide posts published, you can find links to all of them culminated and organized here, on this post. Isn’t that convenient? To enter the giveaways, visit each post, and leave a relevant comment. FOR A THIRD ENTRY: Follow @drdolly and tweet about this giveaways or the Gift Guide, then leave a second comment telling me that you did with a link to your tweet. Note: There’s a maximum of four (4) entries per giveaway. Unless otherwise noted, all Valentine’s Day giveaways close at 11:59 PM on February 14th. 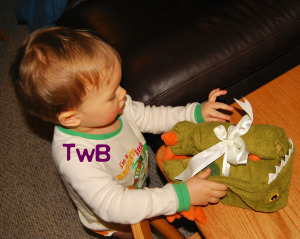 There are a few giveaways launched February 13th or later, and those giveaways will end on February 28th at 11:59 PM. Winners will be selected via random.org shortly thereafter.